Sunday brunch at Wasabi Bistro, originally uploaded by Camemberu. Wow, I very nearly missed this milestone, blogging recklessly without looking at number of posts. This post shall be a short and spartan one, with a sneak preview of what's coming up this week. 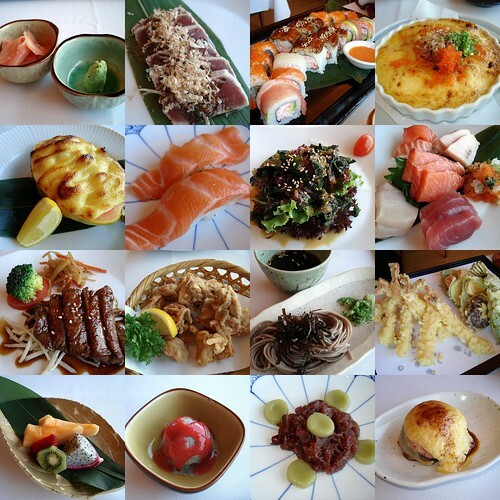 Today hubby and I had a lavish Sunday brunch at Wasabi Bistro (Mandarin Oriental Singapore). I've got like over 20 photos! Will probably have to break it up over a few days, or it will be too long and unwieldy. Congrats on 300th post! How much was the Sunday brunch? Was it a buffet or ala carte? Congrats! The food sure look delicious! keep eating! looks yummy the jap stuff! Loyal fan, it was an a la carte buffet at S$58++ (12 noon to 4pm). Congrats! 300th post and counting! i think i'm close to my 100th post soon, just that haven got the time to post them yet. lol! LOL Brad, has my blog become the buffet blog? I'm still looking for the elusive good yet affordable buffet! Yum yum! You keep posting too. One every day lah! Sure hit 100 very quickly! Wah that's it, I'm going there! Thanks for blogging about it.